Hmmm…weight forward a bit more! Jodi’s Ski Skool is fab! This is where I show my training pics, talk about what I’m trying to do, share my land training and my love of all things involving a water ski. It’s not all about the water practice – I work out at the gym, do swimming, trampolining and land practice so I can apply what I learn to the water training. So it’s kinda cold out there! I’m working on tricks at the moment. This time of year it isn’t so exciting as its just getting all the positions right in preparations for starting new tricks in the spring. When I’m not training at JB Ski I am a the ice rink working on jumps and spins to help with my skiing (and its really fun!). I think that ice skating has helped a lot with water skiing as I have developed good balance to do jump and many of the principles are the same or similar. I think that when you do a sport competitively, it is important to not only do that sport but continue or start others that can help to develop your skills even further. Thank you so much to my ice skating coach Roland! I have really enjoyed learning and competing in jump this year and I want to say a big thank you to Jodi Fisher to lending me the skis for free, thank you so much! I love being a three eventer and being involved in all the disciplines and overall scores. After two years of riding the skis it is thrilling to actually jumping and I am really excited to continue working hard to improve over the next years! Also and big thanks to Richard Mattos and Mark Burridge for all the work they have done in getting the jump back in at JB Ski and John Battleday for all the coaching! 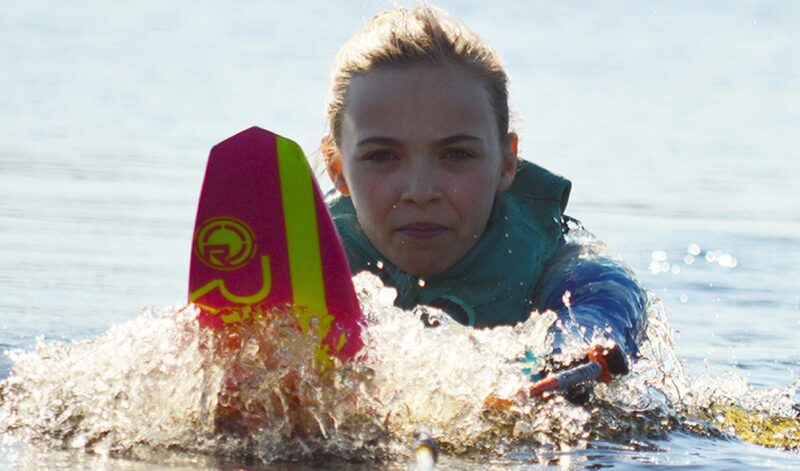 On Thursday the 2nd of August I went all the way to Denham Waterski Club with Dani Halford and Emily Newsome to train with Jodi. We had a great time and Jodi’s coaching was amazing as always, giving me loads of help on my gates to help me run 13 more often. I had three skis with Jodi and did two slaloms and one trick. After nationals we were just working on getting my confidence back on tricks and I had a really good set just practicing my runs and working on my wake 540. Slalom was also very good. We stayed on longer line lengths and worked on technique and my gate pull out to help me get wide enough . This will help me to run shorter rope lengths, especially in competition. Thank you to Jodi for all the amazing coaching and Denham ski club for hosting the day. Hi guys! I have been at competitions for the past few weeks and have been having a great time. My friend and glidesoul sister Amy Whaling has been competing with me and we have both been getting great scores. At Oxford Water Ski I had a good comp getting 1 @ 13m at 52kmph. However I had to pull out after the first round of trick as I was sick which was really disappointing. It also meant that I couldn’t train for jump at Gosfield the next weekend! At the next comp at Gosfield I did really well, matching my PB in slalom in challenging conditions, scoring 2200 in trick and jumping 11m. I was really happy will all my scores but want to beat my score in slalom this weekend at Hazelwood! My half term wasn’t spent revising, or relaxing in the sun. It was spent on the water learning to go over the Jump. I have to be a ‘three eventer’ if I want to get on the British team, but it takes a lot of work, and training for three separate events takes up a lot of time and energy, both mental and physical. So at half term my friend Amy and I went up to Hazelwood Ski World to learn to jump together. Amy is on the squad too as well as Lucy and Tom, who ski at Hazelwood’s regularly, so it was great for all of us to be together. Hazelwood’s is famous for developing great jumpers, and has a world wide reputation for producing great skiers, so I was really happy to be able to learn from Rob Hazelwood. We got there on the first day and the conditions were not great – raining, overcast and a bit cold! I started at 32 kph with the jump at 4 ft 6 inches. Rob held the rope at shoulder height to make the landing easier. It was the first time I’d jumped since Florida and my second ever time going over the ramp. My Mum was so nervous she could hardly watch, but I felt pretty good about it all. Amy and I both had a really good start, landing jumps in our first sets. Over the two days we slowly increased speed and ramp height so we were jumping at competition level. We were both so happy and had a lot of fun! After we had finished jumping Amy, Lucy, Emma and I went tricking together on the back lake. It was so fun to trick with all of them and a great end to the two days. Thank you to Jodi Fisher for lending me jump skis which are light and easy to control going over the jump. I would not be able to do this without his on going support. And also thanks to John Battleday for nearly two years of making me ride the skis so I could control them properly. Yesterday a large parcel arrived for me – always a great addition to any day. Inside were two fantastic Thule bags – just what I needed for competitions and travelling. The first bag can be used as a back pack, a shoulder bag or a normal duffel bag and is the perfect size for my wet suits, gloves, towels and all the other stuff I carry around with me for training and comps. The second bag was a large three event bag which will carry my jump skis, as well as my trick and slalom ski’s plus all my ropes. It has big wheels so it won’t drag across the ground which makes it perfect for travel (especially overseas). Thank you to Jodi Fisher and Thule for supporting me in my dreams. I’ve finally had the news I was waiting for – I made the British Squad!!!!! This is super exciting as it means that I am one step closer to making the Under 14 team for Europeans! I can’t wait for competition season to start so I can show all the selectors what I have been working on all winter and get some scores on the ranking system, it’s going to be a really exciting season! I’m so excited I’ve been asked to be part of Jodi’s Ski Team. Jodi Fisher has been coaching me in Florida for the last few years, and comes over to England to coach as well and catch up with his friends and family. This year he’s the Key Note Speaker at the coaching conference run by the BWSW – details here. He’s an amazing coach and I’m so proud to be part of his team, and so grateful for the support he’s providing. Another big thanks go to Thule bags who are giving the team much needed, and great, equipment. It’s expensive to do three events but with the help of people like Jodi Fisher, and Thomas Syring at Thule I have a much better chance of reaching my dream of representing England at the European Water Skiing Championships. This Easter I went out to Jodi’s to get away from the cold, and to start training to get ready for this coming season. It’s an important season for me as I want to make the U14 team. We spent loads of time on tricks, some time on slalom and even got the jump skis out (more on that later). I had a great time in Florida, and got bedded in on my tricks which I really wanted to do. Everyday, except for one day when we went to the Kennedy Space Centre, I skied at Jodi’s. Sometime 4 sets, each lasting about 30 minutes. So you can imagine it was a lot of work. Hopefully it’s helped get me ready for the first comps, fingers crossed! After a lot of winter practice for Trick skiing it’s time to get back to doing some slalom. It’s important that I get back into the rythm of things for slalom, and that I start the season ahead of where I finished last year…that’s kinda the point of winter training. I know this looks simple…really it does. But it takes ages to be able to do this smoothly on a trick ski. I’ve only been ‘tricking’ for 2 years, so its all still pretty new to me. A side slide is the basis of every trick, and slow, careful control of the ski is vital if I don’t want to go flying. So during the winter – I practice, practice, practice. So that my ski control is perfect when it comes to doing more complicated tricks! And yeah…that’s a dry suit. Skiing in winter isn’t something I’d recommend unless you are super keen!